First impressions: interesting, entertaining, puzzling. I’m really interested by how the form of this novel — alternating chapters that initially appear to be in separate worlds but ultimately converge — mirrors the content. Not only does the isolation of the End of the World suit its reason for being, but so does the cold technology-obsessed nature of the Hard-Boiled Wonderland suit its money-grubbing, self-serving characters. More than that, the End of the World turns out to be a much more imaginative (if somewhat grim) place full of interesting characters and possibility…beneath the surface, anyway. The Hard-Boiled Wonderland — future-Tokyo — is also full of interesting characters, but they’re all characters with serious flaws and no real desire to be changed or saved in any way. Plot spoiler coming now: I think that’s why the narrator chooses to allow himself to transfer his consciousness to the End of the World (a “place” that exists within his own mind only — one that he has created for purposes of self-preservation in the Hard-Boiled Wonderland that is his “real” life) in the end — because despite the fact that the Town’s inhabitants have all allowed their shadows (and therefore their minds) to die and have no real emotions, they have the potential to be awakened to new things. The narrator makes friends there, and his love-interest (the Librarian) shows a genuine desire for his help — she wants him to help her find her mind. He believes there is work for him to do, and that the people he has created in his subconscious need him. In the Hard-Boiled Wonderland, they don’t need him. He’s just another worker engaged in the trading of information that doesn’t belong to him. His wife left him after just a few years of marriage, and his life is empty except for work, whiskey, and old books and movies. 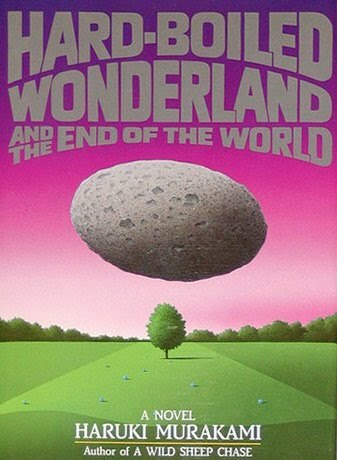 The End of the World offers him something the Hard-Boiled Wonderland cannot: meaning. Significance, importance, other people who depend on him (whether or not they are aware of this dependence). His actions mean something there; in the Hard-Boiled Wonderland, the do not. His neighbors don’t even peek out of their doors when his apartment is being decimated by the two Semiotecs, and the Professor’s granddaughter informs him that they didn’t come out when she shot one of the Semiotecs’ ears off either. His life or death are immaterial there. In the End of the World, he will never die and his life will have meaning. I didn’t expect the ending Murakami wrote. In fact, I was really surprised when the narrator backed out of his escape plan at the last minute, leaving his shadow to escape on his own. … But. … Upon reflection, it makes sense. I was just so firmly rooted in our world that I figured he’d want to stay in the Hard-Boiled Wonderland. Also, I was sentimentally attached to his shadow (more so than the narrator himself was, apparently) and wanted to see them reattached. At the same time, his relationship with the Librarian in the End of the World did seem more complex and interesting than his relationship with the Librarian in the Hard-Boiled Wonderland, and I didn’t consider that too much either. I guess throughout the novel the space allocated to him in the Hard-Boiled Wonderland was being filled in (or erased, depending how you want to look at it) bit by bit. Once the Semiotecs trashed his apartment (destroying his favorite things before anything else), he was basically homeless. Then, his relationship with the Librarian looked like it could be fruitful, but there were indications that it would ultimately go the same direction as his marriage went. So…I guess that just left one option: the End of the World.